Received the following via email from Kermit Geary Jr. Text, photo, and caption are his. While everyone else was out going apey over the pseudo-eSPee painted UP loco on train 212 today, I was lucky to find this "REAL" Heritage unit parked in front of The Jim Thorpe Market in Jim Thorpe, PA today. Following article is from the Youngstown, Ohio Vindicator. An $850 million investment to improve railroad infrastructure across Ohio and allow more freight from ports in the eastern part of the country to pass through the Midwest is nearing its completion date of spring 2013. CSX Corp., which operates more than 4,000 miles of track in the Buckeye State, first launched the National Gateway initiative in partnership with the federal government, which committed to match millions in private funding in 2008. Since then, CSX has worked to expand rail capacity across six states to improve the flow of freight on much of its system by allowing double-stack freight cars to travel on it. 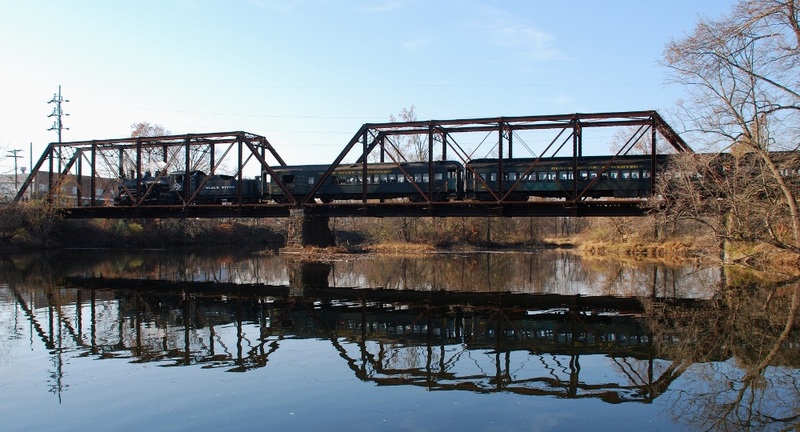 In the Mahoning Valley, a new $1.4 million composite steel bridge was constructed in Niles, and an abandoned railroad bridge between the Mahoning River and Mahoning Avenue was removed as part of the project. A growing population, expected to exceed 70 million people in the next 25 years, will place undue stress on the transportation networks of metropolitan regions. This has led both private industry and the federal government to focus more on upgrading the nation’s ailing infrastructure. “Getting those tunnels and overpasses up to height or removed all together has been critical to this project,” said John Spychalski, professor emeritus of supply-chain management at Pennsylvania State University and a faculty affiliate at the Pennsylvania Transportation Institute. Trains can move 1 ton of freight nearly 500 miles on a single gallon of fuel, and one train can carry the load of 280 trucks, according to the U.S. Department of Transportation. Improving the rail networks with projects such as the National Gateway will reduce traffic congestion in metropolitan regions and allow more goods to reach a growing population faster and at reduced costs, Spychalski said. The double-stack freight cars will use a series of intermodal terminals in Ohio, Pennsylvania, West Virginia, Virginia, Maryland and North Carolina. Intermodal terminals are large distribution centers designed to ease the transfer of goods from train to truck. Spychalski said that regardless of where those terminals are located — in North Baltimore and Columbus in Ohio’s case — it will allow businesses across the state more logistical options in moving their goods. Both CSX and its competitor Norfolk Southern have invested heavily in Ohio, while ports along the East Coast are investing more in improvements as they anticipate an influx of goods from Asia with the expansion of the Panama Canal. Similar improvements are being made across Canada and in southern parts of the country. 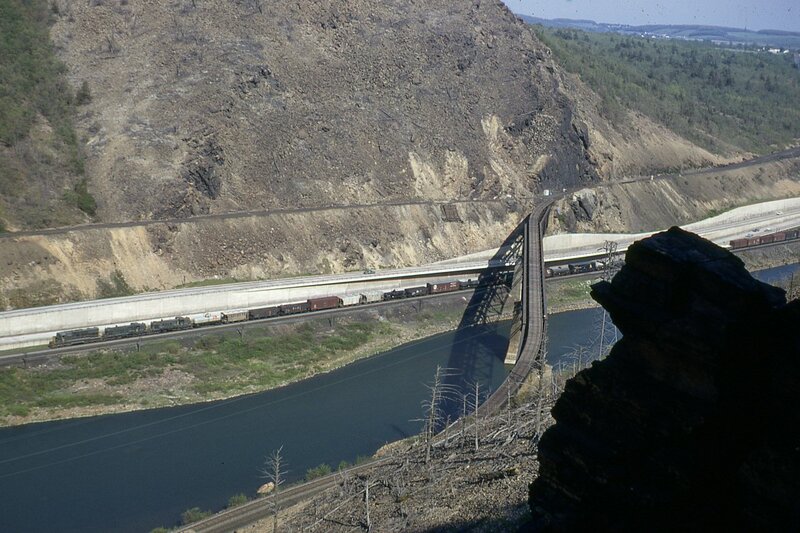 Ports in California already handle more than 40 percent of the nation’s imported goods, and with the Panama expansion, Spychalski said improved railroads could help the East Coast capture more of those products and provide places further west such as Youngstown, Chicago and even St. Louis with more options for moving product. “All these projects complement one another, and the more product you can move, the stronger the economy will be,” Spychalski said. An email that we received had the following additional information about Dr. John C. Spychalski who is quoted extensively in the above article. He is now Professor Emeritus of Supply Chain Management. A world railway economics and history authority, Dr. Spychalski was Chairman of Penn State's Department of Business Logistics for 16 years and Editor of the Transportation Journal for 28 years. Following article is from the Star-Ledger for Nov. 19, 2012. Be sure to follow the link to the Reuters article; then read the NJT response in the next posting below. By The Star-Ledger Continuous News Desk The Star-Ledger on November 19, 2012 at 1:49 PM, updated November 19, 2012 at 2:25 PM Twenty-four percent of NJ Transit's rail fleet was damaged during Hurricane Sandy after rail cars and locomotives were stored in two rail yards that forecasters predicted would flood, according to a report on Reuters.com. The decision might cost the transit agency tens of millions of dollars to make the necessary repairs, which could take months, Reuters said. NJ Transit parked equipment at Meadows Maintenance Complex, near the Hackensack and Passaic rivers and at its Hoboken terminal and rail yard. A person described as a "senior transportation official" told Retuers that NJ Transit launched a probe of why the equipment was left in a flood prone area. A spokesman for New Jersey Transit and James Weinstein, the agency's president. said no probe was launched. A storm surge of of 6 to 11 feet was predicted to hit the area. The Kearny yard is between 0 and 19 feet above sea level, the report said. Nine dual-powered locomotive engines and 84 multi-level rail cars purchased that cost about $385 million were among the equipment damaged. The following is an article from the Star-Ledger for Nov. 21, 2012; but read the posting above first, and be sure to follow the link to the Reuters article. on November 21, 2012 at 6:30 AM, updated November 21, 2012 at 11:02 AM The executive director of NJ Transit is defending the agency's decision to leave trains in rail yards that ended up under water during Hurricane Sandy, saying those locations had no history of flooding and that no one could have predicted the extent of the storm surges that left some stations with six feet of water. 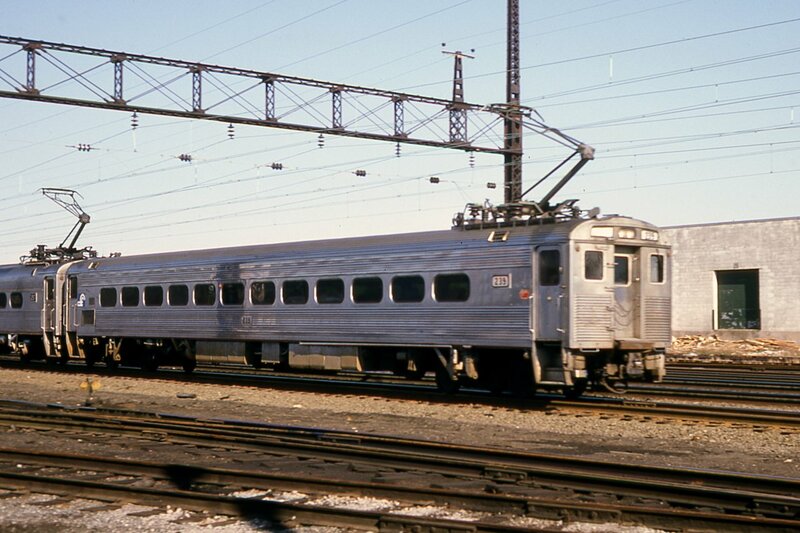 "We stored it where it should be," Jim Weinstein, who was joined by some of his top brass at the statewide transit agency, said during an interview Tuesday with The Star-Ledger. "Unfortunately, it’s the worst storm we’ve ever had in New Jersey." NJ Transit has come under criticism for leaving equipment in places such as Kearny and Hoboken with Hurricane Sandy bearing down. 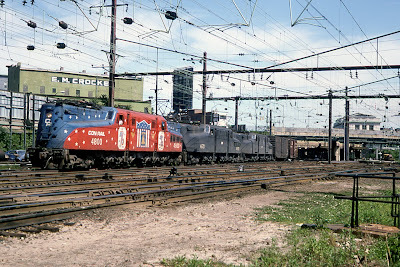 Damaged during the storm were 261 train cars and 62 locomotives. "They made a decision, and as Burke said to Ripley in Alien, ‘It was a bad call’" said David Schanoes, a railroad consultant from New York and retired deputy chief of field operations for the Metro-North railroad. "My God, New Jersey’s a swamp." Schanoes said weather projections had the storm surge in the Kearny-Hoboken area at 10 to 13 feet. 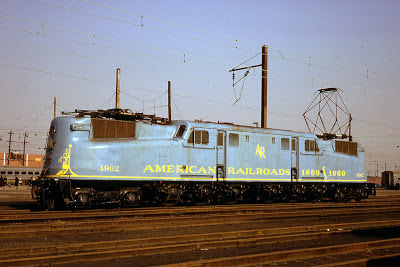 "Look at it as a bank vault," Schanoes said, noting that some locomotives are worth $5 million. "You’ve got a bank vault with $5 million and robbers are coming. Do you leave the money in the bank vault or move it out of the way?" Weinstein said NJ Transit officials were monitoring the storm and didn’t expect the surge to flood the rail yards. The Meadows Maintenance Complex in Kearny has been around for nearly 30 years and never flooded the way it did during Sandy, he said. Last year, NJ Transit lost no equipment during Tropical Storm Irene. 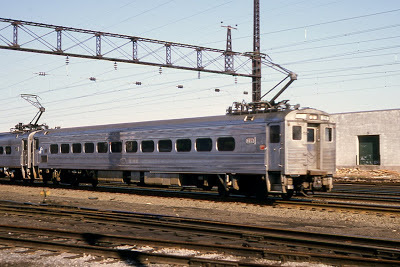 In anticipation of that storm, officials made the decision to move trains from Trenton to an NJ Transit rail yard in Morrisville, Pa. That kept the trains dry, but also marooned the equipment because it couldn’t be reached from flooded Trenton. Learning that lesson, NJ Transit officials this time moved trains from Morrisville to other locations in New Jersey. But that left little space for other trains to be moved. "The answer is, there is no place to put them," Weinstein said of the trains in Kearny. "The MMC is our central maintenance and operations facility. That’s it. That is ground zero for the railroad." Kevin O’Connor, NJ Transit’s vice president and general manager of rail operations, said finding a dry place to store trains is no easy task. "If you take our rail map and superimpose it over a map of the state of New Jersey with rivers, the ocean and everything there, how close are all of our lines to water?" he asked. "They’re all close to water or on the water — every single one of them, whether it be the ocean, a river, a bay." O’Connor said that given the massive flooding in Hoboken this time, "We’re going to have to look at where we could possibly store this stuff." As with every major storm, he said, precautions are taken. Equipment is moved. The train wire system is de-energized. Rail crossing gates are removed so the wind doesn’t snap them or the gates don’t get stuck in the down position and impede residents who are trying to evacuate. Joe Meade, superintendent of the Hoboken transit division, said floodwater has made it into the terminal before, but never onto the higher ground where the trains are stored. "‘92 was the highest water that ever came into Hoboken — that was the Perfect Storm, the unnamed storm, again on Halloween, and we got about 2 1/2 to 3 feet of water in the terminal," he said. "The old-timers then said they’d never seen anything that high." During Sandy, six feet of water poured into the Hoboken Terminal and some trains on the higher ground were also damaged by floodwaters. Weinstein said he was proud of the way transit agency employees — despite some having their own homes damaged in the flooding — were able to get 80 percent of bus service restored within 48 hours of the storm and 93 percent of the rail service restored at the beginning of this week. "They’ve done some miraculous stuff here," he said. Employees worked 16-hour days to restore rail service, in spite of boats lodged in rail drawbridges, trees that toppled onto wires that power trains and stations that were left with flooding, mud and dead fish in the waiting rooms. "It was important because, without (the system) back in place, this state can’t come back to normalcy," Weinstein said. "People can’t start conducting their lives the way they need to conduct their lives and the way they want to conduct their lives." All rail lines but the Gladstone Branch have been restored to at least partial service, and at least partial service could return to that branch around Dec. 1, transit officials have said. Along the Gladstone Branch, the hurricane-force winds snapped the 90-foot wooden poles that carry the electrical train wires. Weinstein was optimistic that most of the damaged rail equipment will be covered by insurance, and said some of the equipment has already been repaired and returned to service. He said the agency will assess what worked well and what didn’t during Hurricane Sandy. But, Weinstein said, critics of where NJ Transit kept the trains might not realize how complex a process moving them can be. "People say, ‘Oh, you just move the trains,’" he said. "This is not a toy train set, They’re not buses you buy at a Hess station for your kids at Christmas. This is real life. This is big machines that take a lot of people who are very well trained." ATLANTA – At a dedication ceremony here Nov. 10, Norfolk Southern named its rail welding facility after the late Hubert L. Rose, who retired from Norfolk Southern as senior assistant vice president maintenance of way and structures and planning in 1991, after a 43-year career with the company. Rose, who died in January 2012, headed the railroad’s maintenance of way group for 15 years, during which he led the railroad in its transition from laying jointed rail, which uses bolts to connect 39- or 78–foot sections of track, to installing continuous welded rail, in which 1,440-foot sections of rail are welded together to form one continuous track. Continuous welded rail is stronger, provides a smoother ride, needs less maintenance, and allows trains to travel at higher speeds. A native of Kenly, N.C., Rose graduated from North Carolina State University and in 1948 joined Southern Railway as a surveyor. In 1971, he was named chief engineer, and in 1976, he was promoted to assistant vice president of maintenance of way and structures, the position he held until his retirement. 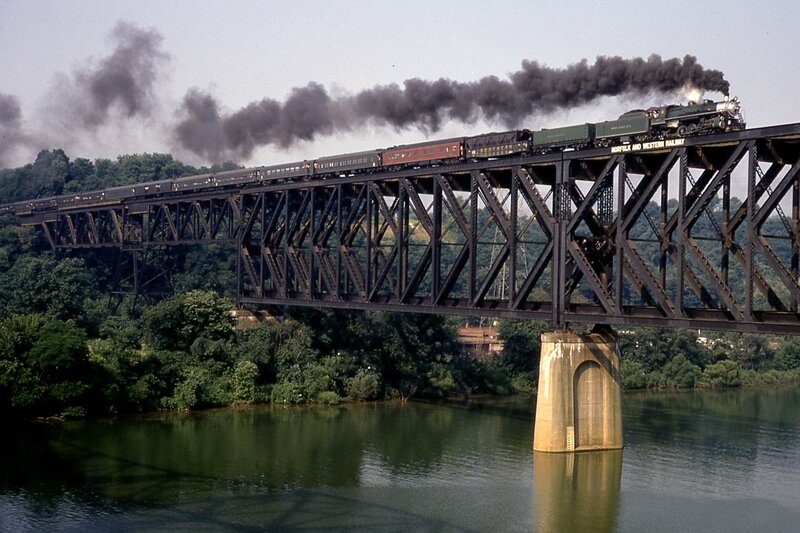 Since opening in 1958, the Atlanta rail fabrication plant has been manufacturing railroad track for Norfolk Southern. The complex stretches over 30 acres and includes plants for rail welding, rail renewal, switch panels, track panels, and rail reclamation. The rail welding and rewelding plants turn out new quarter-mile strands of rail for use on mainline tracks and reconditioned rail for use on secondary lines and industrial sidings. JACKSONVILLE, Fla., (November 15, 2012) - Fredrik Eliasson, CSX Corporation (NYSE: CSX) executive vice president and chief financial officer, will participate in an interactive dialogue on the current state of the business hosted by Scott Group, director and senior transportation analyst at Wolfe Trahan and Company, Wednesday, November 28, 2012 at 11:30 a.m. Eastern Time. Investors interested in participating in the conference call may dial (888) 267-2845 or (973) 413-6102 and enter the conference ID 547822. Participants should dial in ten minutes prior to the call. A replay will be avaialble at http://investors.csx.com approximately one hour following the conclusion of the call. Received an email with the following comment and a link to the newspaper article below. "Evidently the truck driver must have been from out-of-state since the roads around the grade crossing are not driver friendly for tractor trailers." BRANCHBURG — A New Jersey Transit train empty of passengers struck a tractor-trailer on the tracks near a Somerset County station Monday night, an official said. About 7:45 p.m. the train was heading back to the railyards along the Raritan Valley Line when it struck the tractor-trailer at a road crossing near the North Branch station in Branchburg, an NJ Transit spokesman said. A conductor on the train was taken to a nearby hospital for non-life threatening injuries, said spokesman John Durso. Remaining members of the skeleton crew was not hurt, he said. It was unclear why the tractor-trailer was on the track, or if there was anyone inside the trailer when it was struck, Durso said. Commuters were being bused between the High Bridge and Raritan stations while the rail line was shut down, he said. By midnight, the tracks were clear, officials said. With Sunday's sun breaking through the morning fog, this day was turning out to be unseasonably nice to track side chasing BR&W's 10:45 AM and 2 PM steam excursion runs. After Hurricane Sandy and that snowy nor'easter NJ experienced over this past week, Sunday's sun and warmth served to be a good tonic for lifting some weather weary spirits. Attached are some images from Sunday's two runs. Image 1: finds #60 backing its four coach consist across the River Avenue grade crossing into the Three Bridges (NJ) yard on the first run. Image 2: The engineer takes advantage of an unseasonably warm day as he peers out the window, , #60 passes beneath the Pennsylvania Avenue bridge on its first trip of the day with Ringoes being its destination. Image 3: The final run of the day finds # 60 shoving the coaches towards Three Bridges as it crosses over the Raritan River. NORFOLK, VA. – The Norfolk Southern Foundation is increasing its support of American Red Cross Hurricane Sandy relief work. NS now will provide a 1:1 match for contributions made by active and retired NS employees to the organization. Individual gifts of at least $25 (by check, credit card, and donated stock) will be matched under this special program. Gifts made between Nov. 6, 2012, and Dec. 31, 2012, will be matched up to a maximum corporate contribution of $50,000. Employees and retirees who donate by check should print, fill out, and enclose a Norfolk Southern Foundation Matching Gifts form with their gifts. Employees and retirees who donate by credit card should forward copies of their online receipts to Norfolk Southern Foundation, Box 229, Three Commercial Place, Norfolk VA 23510. The special matching program follows NS’ Nov. 2 contribution of $100,000 to the American Red Cross. Received an email alerting us to this YouTube video. Hop into the locomotive of the GE Juice Train and check out the view as its 48 hour trip from Florida to New Jersey is accelerated into just a few minutes in this time lapse video. Norfolk Southern plans to operate scheduled train service and other rail operations over the Thanksgiving Holiday. Some unit train operations and local service may be reduced depending on customer operations. Our Operations and Service Support Center will contact local customers to confirm needed service over the holiday weekend. Customers may also contact their Operations and Service Support or National Customer Service Center regarding questions on specific shipments or local service requirements. The latest ETA and routing information is always available through Pacesetter and accessNS. JACKSONVILLE, Fla. - November 8, 2012 - CSX was recognized as the number two military-friendly employer on G.I. Jobs' 2013 Top 100 Military Friendly Employers ranking today, leading the transportation industry for the third consecutive year. "We actively work to hire the best employees to serve our customers, and that means recruiting U.S. military veterans with strong backgrounds in team environments, safety training and leadership skills," said Michael J. Ward, CSX chairman, president and chief executive officer. "As we prepare to celebrate Veterans Day, CSX is proud to support and employ the men and women who have defended and protected us." This recognition celebrates CSX's ongoing commitment to support the U.S. military and its veterans - one in five CSX employees have served in the armed forces. In May, CSX was also honored as a Most Valuable Employer for Military by CivilianJobs.com. Since 2006, G.I Jobs has issued an annual ranking of businesses based on veteran recruiting practices. The publication examines more than 5,000 American businesses with more than $500 million in annual revenues. Out of these eligible members, only two percent make the annual ranking. G.I. Jobs ranks each company by weighted factors, including long-term commitments to hire veterans, specialized military recruiting programs and supportive policies for reserve member employment while off duty. To view the full list of G.I. Jobs' 2013 Top 100 Military Friendly Employers, please visit http://militaryfriendly.com/. Received the following via email. 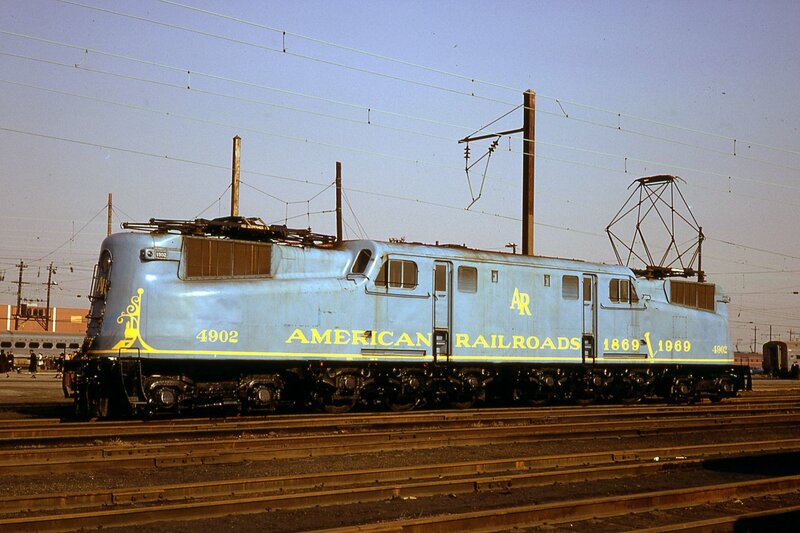 Also see the posting below for pictures of this locomotive. ALTOONA, PA. and NORFOLK, VA. – Norfolk Southern is placing a one-of-a-kind “Veterans Locomotive” into freight service on its system to honor people who have served in the military and reserves, especially those employed by the railroad. No. 6920 is an SD60E model that will operate primarily in general freight service. 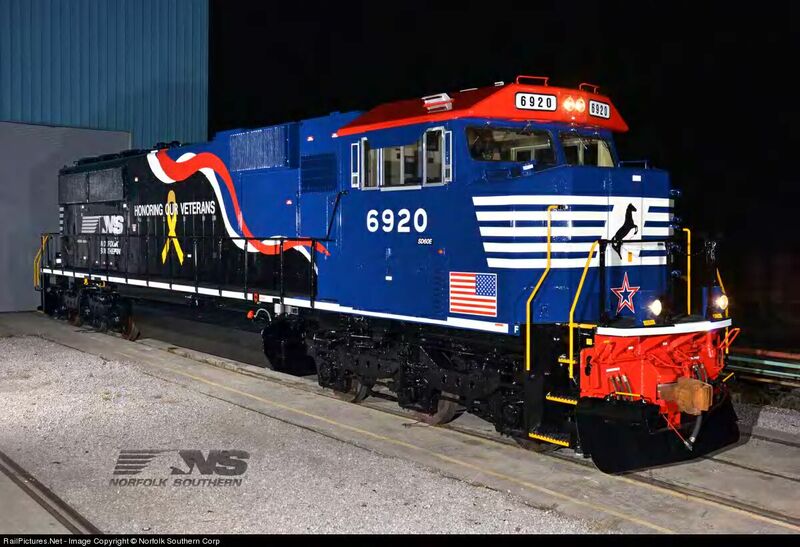 Its red, white, and blue paint scheme, and yellow ribbon with the message “Honoring our Veterans,” was selected by a group of 18 NS employees representing all branches of the armed forces. Some 450 NS employees, active military representatives, civic leaders, news media, and other guests of the railroad will attend two invitation-only unveilings of the Veterans Locomotive. The first unveiling, at Norfolk Southern’s shops in Altoona, Pa., where the unit was built and painted, is Thursday, Nov. 8. NS General Foreman Tim Strickenberger, a former U.S. Air Force staff sergeant who served as an F-16 aircraft mechanic during U.S. operations in the Middle East, and Trainmaster Calvin Law, a 26-year U.S. Navy veteran who served as a lieutenant commander during Operations Iraqi Freedom and Enduring Freedom, will speak about their military and railroad experiences. Keynote speaker will be Col. Grey Berrier II, deputy commander, 2nd Infantry Brigade Combat Team, 28th Infantry Division, Pennsylvania Army National Guard. The second unveiling, at NS’ Lamberts Point coal transload facility in the railroad’s headquarters city of Norfolk, Va., is Monday, Nov. 12, which is the morning after Veterans Day. Chris Carter, NS conductor and chief warrant officer 2, Virginia Army National Guard, will address the guests about his military and railroad experience, and CEO Moorman will highlight NS’ desire to attract even more veterans into railroad careers. Keynote speaker will be Col. William J. Davis, U.S. Marine Corps (retired), director of the MacArthur Memorial and executive director of the General Douglas MacArthur Foundation. Painting the Veterans Locomotive involved 26 NS employees, two of whom are veterans, using 66 gallons of primer and paint over a 112-hour period. To the extent possible, No. 6920 has been kept under wraps while the work has progressed. 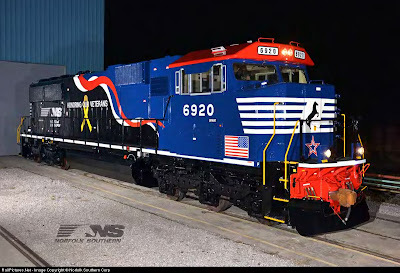 With its non-traditional paint scheme, the locomotive joins NS’ Heritage Fleet of 20 locomotives that were painted in the schemes of key predecessor railroad companies earlier this year in observance of NS’ 30th anniversary. Photos of No. 6920 will be posted on NS’ web site and the Facebook, Twitter, Flickr, and YouTube social media sites after the Nov. 8 unveiling. Daytime views, fresh out of paint shop, at attached link. Also at that link are 2 short videos. 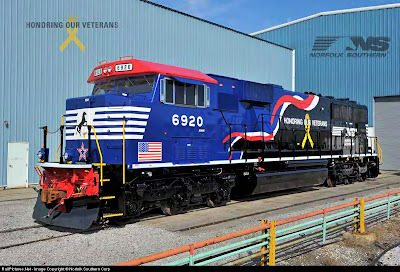 The "Two Careers - One Mission - Let's Roll" video, honoring those who proudly served in our U.S. Armed Forces and are now working for Norfolk Southern, is impressive. 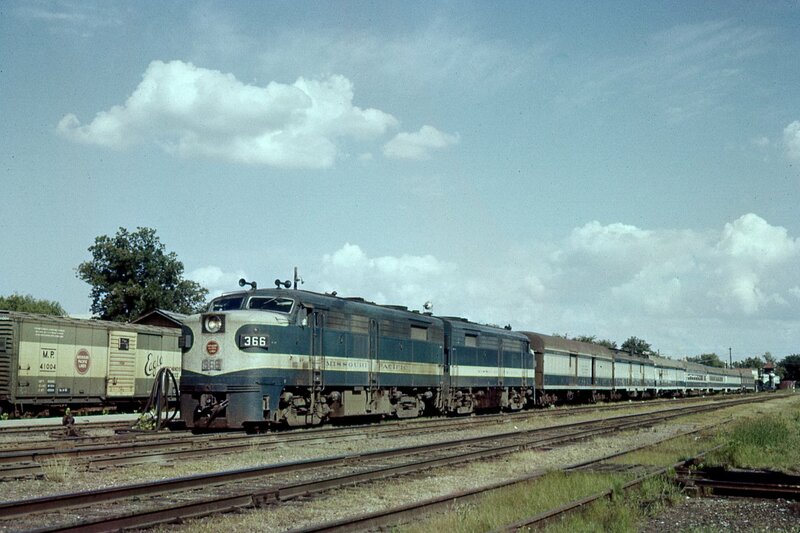 Here are 2 photos of the NS Veterans locomotive. See the web site above for more photos. 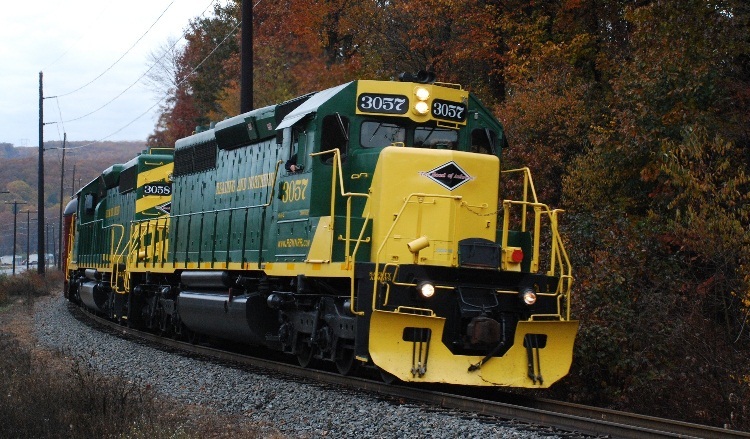 NORFOLK, VA. – Norfolk Southern Corp. has issued its fifth annual corporate sustainability report, documenting progress on the railroad’s efforts to reduce its business impacts on the environment. The 2012 report can be found on Norfolk Southern’s environmental website, www.nssustainability.com. It highlights advances made in the five years since the company launched a sustainability program with the goals of achieving industry leadership in fuel conservation, emissions reduction, efficient energy use, recycling, use of renewable materials, and environmental partnerships. The report details initiatives involving social responsibility, economic performance, and environmental conservation. 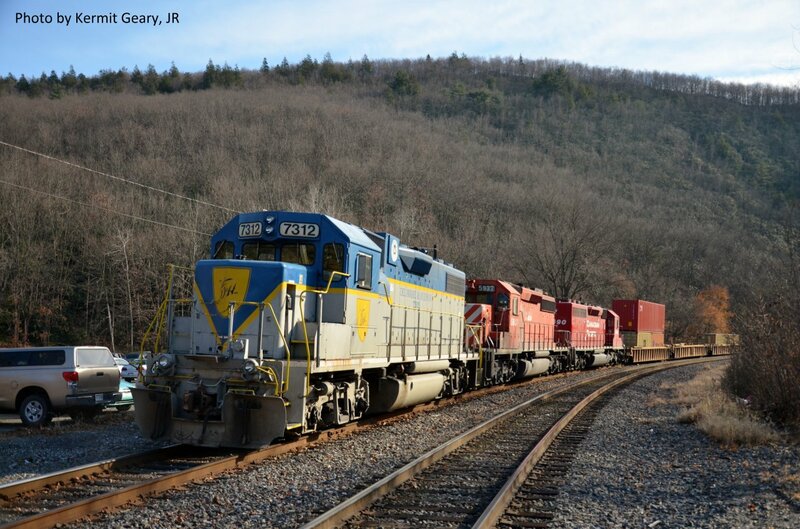 Among other highlights, the railroad reports reaching nearly 60 percent of a five-year goal to reduce its greenhouse gas emissions. Norfolk Southern set a goal to reduce carbon emissions by 10 percent per revenue ton-mile of freight between 2009 and 2014. 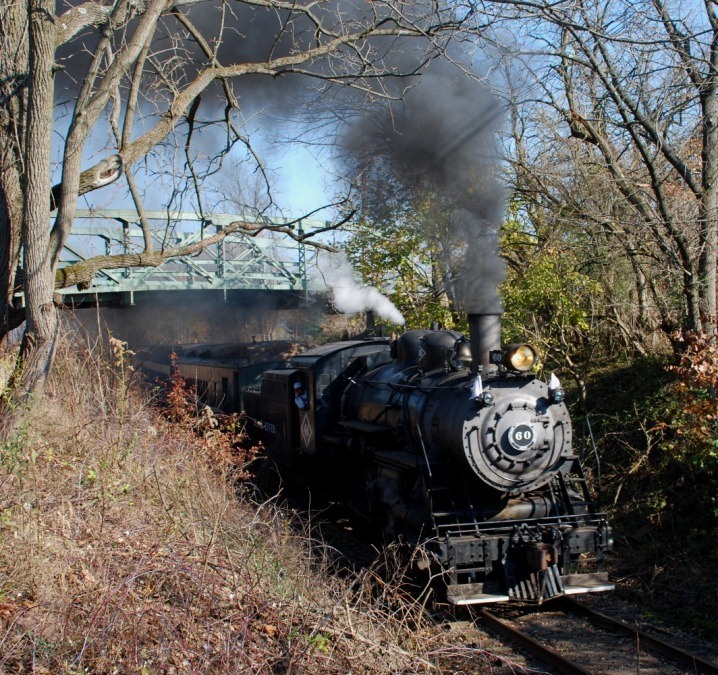 By the end of 2011, the railroad had reduced emissions by 5.9 percent per revenue ton-mile. The report outlines strategies the railroad has adopted to reduce emissions, including use of technologies and computer-based systems to improve network operating efficiencies and the fuel economy of its locomotive fleet, the company’s largest source of carbon emissions. “Even as increased demand for our freight transportation services has led to higher fuel consumption, we are constantly working to improve our greenhouse gas intensity,” notes Blair Wimbush, vice president real estate and corporate sustainability officer. The report also updates progress on Norfolk Southern’s $5.6 million Trees and Trains program, an initiative launched in June 2011 with partner GreenTrees to reforest 10,000 acres in the Mississippi Delta. 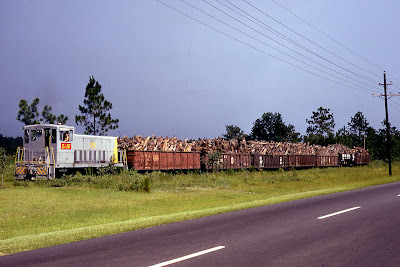 As part of a broader plan to reduce potential environmental impacts of its railroad operations, Norfolk Southern is working with private-sector partners to sustain longleaf pine forest ecosystems and to restore American chestnut trees to their native range through planting initiatives at former coal mine sites. “Norfolk Southern’s sustainability program is all about minimizing our footprint while connecting with partners who share our vision for responsible corporate environmental stewardship,” Wimbush said. In keeping with the Halloween Spirit, I am sending you photos from the archives....the dates are wrong, but reflect when the image was originally processed. Enjoy! JACKSONVILLE, Fla. - November 1, 2012 - Fredrik Eliasson, CSX Corporation (NYSE: CSX) executive vice president and chief financial officer, will address Baird's 2012 Industrial Conference in Chicago on Wednesday, November 7, 2012, at 9:40 a.m. CST/10:40 a.m. EST. Access to the audio webcast will be available on CSX's website at http://investors.csx.com. A replay and accompanying audio will be available following the conclusion of this event. Additionally, presentation materials will be posted on the company's website. 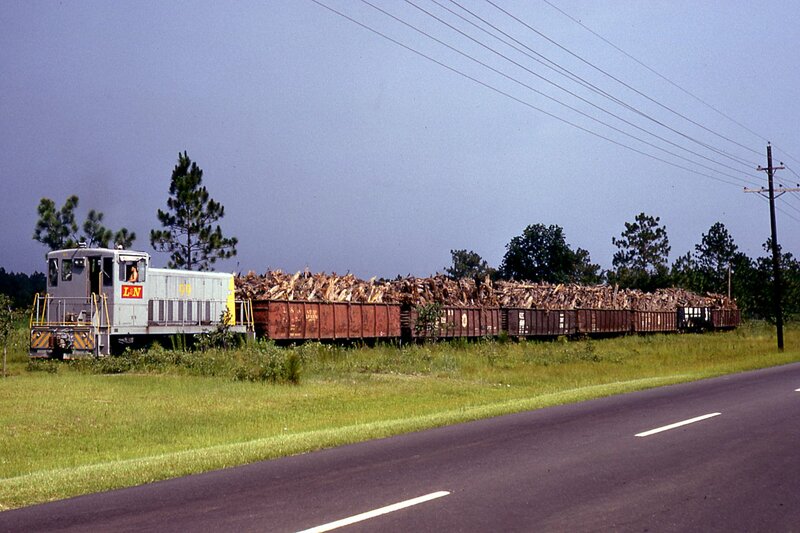 CSX Corporation, based in Jacksonville, Fla., is one of the nation's leading transportation companies, providing rail, intermodal and rail-to-truck transload services. The company's transportation network spans approximately 21,000 miles, with service to 23 eastern states, the District of Columbia and two Canadian provinces. CSX's network connects more than 240 short line railroads and more than 70 ocean, river, and lake ports. More information about CSX Corporation and its subsidiaries is available at www.csx.com. 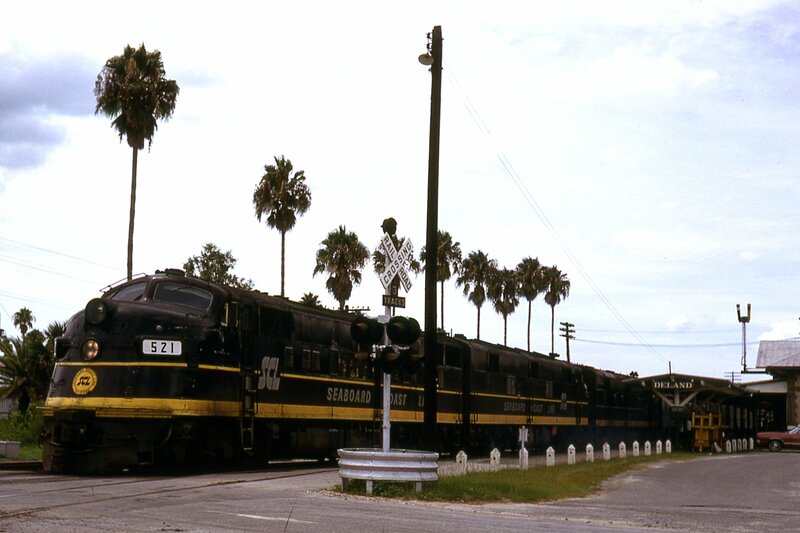 Like us on Facebook (http://www.facebook.com/OfficialCSX) and follow us on Twitter (http://twitter.com/CSX). 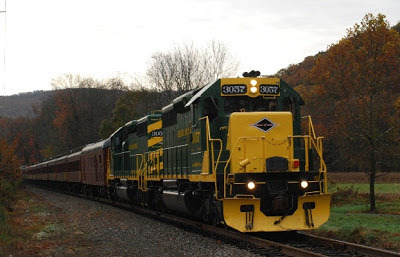 Norfolk Southern has implemented emergency plans for the Northeast region that could be effected by Hurricane Sandy. Traffic in Virginia through New England may be impacted by heavy rains, flooding, and high winds. Rail traffic in these areas should expect delays of at least 72 hours. ...with the Middlebrook Industrial Track (MIT) now severed at Route 22 in Bridgewater, a temporary ballast loading facility has been constructed adjacent to Polhemus Lane and NJT's RVL between MPs 31 to 32. Stone is trucked over from the Chimney Rock Quarry to this location and then loaded into ballast hoppers. 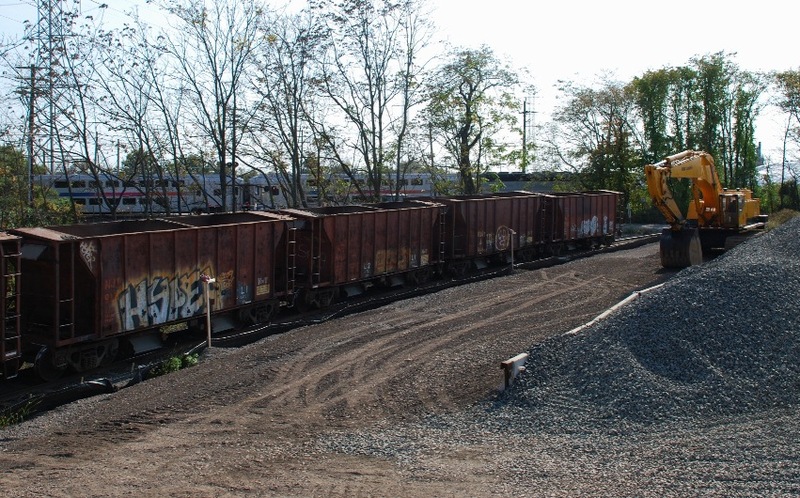 Photo 1: October 14: shows some ballast hoppers on the MIT awaiting to be loaded. In the background can be seen NJT 5523 passing through the Polhemus Lane grade crossing after departing from the Bridgewater station. Photo 2: October 27: I am speculating that these hoppers were filled with a larger type of stone in anticipation of Sandy's arrival in NJ on Monday should there be any washouts along NJT's RVL. Photo 3: October 27: A roster shot of NJT 9200 that is filled and ready to go should those stones be needed after Sandy's departure from the area. NORFOLK, VA. – Norfolk Southern Corp. announced that Timothy J. Drake, vice president engineering, is retiring Oct. 31. Michael J. Wheeler, formerly vice president transportation, has been named vice president engineering to succeed Drake, and Terry N. Evans, formerly vice president process engineering, will follow Wheeler as vice president transportation. Wheeler joined NS in 1985 as a research engineer. He served in positions of increasing responsibility in operations before being named vice president transportation, his most recent position, in 2009. He holds degrees from the University of Tennessee and Virginia Tech. Evans joined NS in 1979 as a management trainee in the operations division. He served in positions of increasing responsibility in operations before being named vice president process engineering, his most recent position, in 2009. Evans is a graduate of North Carolina Central with degrees in education and history. “Terry and Mike bring a range of valuable experience to their positions and will help lead the way as our shippers and receivers come to rely even more on the railroad industry as the backbone of the economy,” Moorman said. Wheeler and Evans report to Mark D. Manion, executive vice president operations. Their appointments are effective Nov. 1. Both are headquartered in Norfolk. PITTSBURGH, Pa. - October 23, 2012 - CSX Corporation Chairman, President and chief Executive Officer Michael J. Ward today joined federal, state and local officials from the Commonwealth of Pennsylvania to mark the midway point of progress on the first phase of projects for the National Gateway. The National Gateway is an $850 million public-private partnership launched in 2008 to alleviate freight bottlenecks in the Midwest that cause delays for companies and consumers shipping or receiving freight from west coast ports by creating a double-stack cleared corridor for intermodal rail shipments between the Midwest and the mid-Atlantic ports. Once completed, the National Gateway will help provide CSX customers with better access to competitive, environmentally friendly double-stack intermodal freight rail service. The celebration took place at Pittsburgh's SouthSide Works, where the $13 million J&L Tunnel project will soon become the latest Phase One project to increase the vertical clearance on CSX rail lines to accommodate trains carrying double-stack intermodal containers. Phase One, creating double-stack rail access between CSX's state-of-the-art intermodal terminal in Northwest Ohio, and its new modern intermodal terminal in Chambersburg, Pennsylvania, is scheduled to be completed by spring 2013, and will enable more freight to move through the region on the same number of trains. The J&L Tunnel clearance project, an upgrade to a tunnel built in the 1880s that runs directly through the SouthSide Works complex, will help alleviate pressure on regional highways and lower the cost of doing business in the Pittsburgh region by improving access to intermodal freight shipping options. The J&L Tunnel upgrade and other National Gateway projects are funded through contributions by CSX and the federal government, as well as a $35 million Pennsylvania Transportation Assistance Program (TAP) Grant. The State of Ohio is also contributing $30 million to this first phase of clearance work. "We are proud that we have been able to work with our partners in the federal and state government, communities and the private sector to invest in strategic transportation infrastructure that will alleviate highway congestion and enable our customers to better leverage rail, the most environmentally friendly way to ship goods over land," said Ward. As one of the nation's largest transportation projects, National Gateway will create more than 50,000 jobs over a 30-year period, including more than 9,000 jobs for Pennsylvania. When completed in 2015, to coincide with the expansion of the Panama Canal, which is expected to increase traffic through East Coast ports, the National Gateway will provide more than $1.6 billion in public benefits to Pennsylvania in the route's first 30 years of operations by decreasing fuel consumption, lowering emissions, improving safety, reducing highway maintenance costs and saving shipping costs. JACKSONVILLE, Fla. - October 24, 2012 - CSX Corporation today announced that INland Logistics Port in Kingsbury is Indiana's first location to receive CSX's Select Site designation. 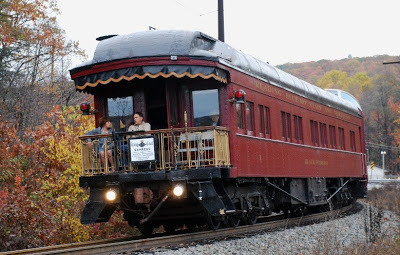 ...This trip which departed from Port Clinton, Pennsylvania on the morning of October 20 was heading to Jim Thorpe on this "Fall Foliage Excursion". 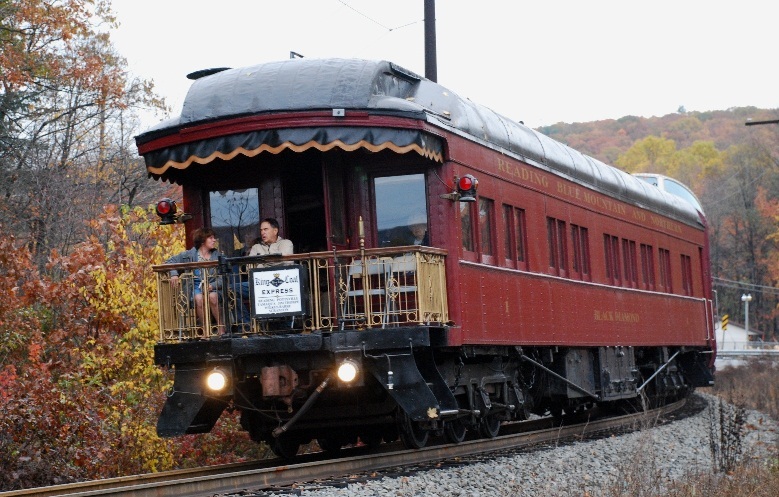 It would be the last of three October excursion trips the Reading & Northern scheduled for the passengers to admire autumn's colors. Unfortunately Friday night's rainstorm left some lingering cloud cover dulling the hues and making for a rather dreary start to the trip. 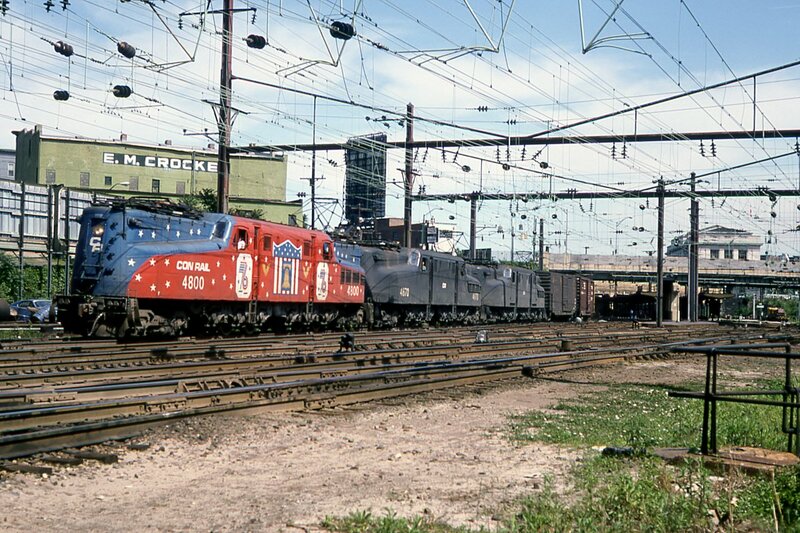 Reading & Northern's motive power consisted of two SD40-2s. 3057 (ex-UP 3066; nee CNW 6901) and 3058 (ex-UP 3426) were in charge of a consist that had nine coaches, a dome car with "Black Diamond" bringing up the rear markers. The first image was taken as the excursion was approaching New Ringgold. The second and third images were taken near Zehners.